Tyler Shields posted a new video with Garret and Ali Cobrin today, called “The Salton Sea.” You can find out who got hurt and how while making it and check out some photos from the shoot at TylerShields.com. Syfy’s new hit series Alphas will feature an impressive lineup of special guest stars for its debut season. Garret Dillahunt (Raising Hope), Summer Glau (Terminator: The Sarah Connor Chronicles), Alaina Huffman (Stargate Universe), Rebecca Mader (Lost), Brent Spiner (Star Trek: The Next Generation), Lindsay Wagner (The Bionic Woman) and Peter Wingfield (Caprica) will join previously announced recurring guest star Valerie Cruz. If you missed it on Twitter like I almost did, Garret has joined The Thrilling Adventure Hour, a “sophisticated comedy sprinkled with affectionate homage to 1940s era radio,” which is recorded live at the Largo at the Coronet in Hollywood. If you’re in the area on August 6, you can get tickets at Laughstub.com. The August 6th show features guest stars Nathan Fillion, Linda Cardellini, Janet Varney, Colin Hanks, AND MORE! Acker & Blacker’s The Thrilling Adventure Hour is a staged comedy production in the style of an old-time radio show that proves radio is still the king of all media! As for Memphis Beat, episode 2×06 airs tomorrow (Tuesday, 9 pm, TNT), but it’s not called “Body of Evidence,” but “Troubled Water.” Not sure if this is Garret’s episode as I haven’t seen him in the promos. Paula calls on Dwight to help one of his oldest friends, who has been arrested in a case involving three gunmen who robbed a party boat. Dwight’s investigation brings him face to face with an old flame and gives him a chance to perform with one of his old band members from his high school days. Amigo will be out in a limited release (see list of theatres at amigomovie.com) in the U.S. in about a month, so a new poster and trailer have showed up online in the last week or so. 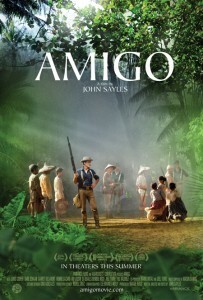 You can also check out a BTS featurette, “The Making of Amigo,” on the film’s Facebook page (you need to be logged in).